BeenVerified.com Reviews - Legit or Scam? BeenVerified.com Reviews – Legit or Scam? 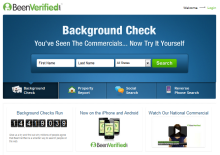 BeenVerified.com is online database that allows anyone to perform background checks. Using just a name and a state of residence, Been Verified can provide a variety of resources on a new neighbor, a prospective date, or anyone you wish. Been Verified is not a credit agency or a private investigator service. The records you access at Been Verified are simply a collection of publicly available records on the person in question. You may receive one background check at a cost of $19.95, or you may become a member of the site. Members may request unlimited background checks throughout the duration of their membership. A membership begins with a free 7 day trial, and will result in no charges if you cancel before the trial period ends. Memberships have a monthly subscription fee based on length of subscription: $8/month for 12 months, $13/month for 6 months, or $16/month for 3 months. Do you have experience with BeenVerified.com? If so, please leave a review below. Average Rating for " Been Verified " is 1.38 out of 5 based on 202 reviews. SCAM --- Do not use this. I called to cancel because I only wanted it for 6 months. It to locate people for a class reunion. They keep charging me even though I called and cancelled. Customer Service Joshua was absolutely no help. Now going through my bank. Before i signed for the trial, i entered the phone number i wanted to look for, all infos i could get. To make it believable, they startes the scan, BOOM! they showed me a report like names, possible addresses and emails and social networks in a BLURRY status and told to subcribe to reveal those BLURRED infos! And then BOOM again! My excitemeny went to agitation. After giving them my personal infos, bank infos and my phone number, Its was a direct slap on my face to not get infos of the report. CALLED THEM JUST TO BE TOLD..."Ok we have to EDUCATE" how this works! JESUS! HOW DARE YOU NOT EDUCATE ME BEFORE I SUBSCRIBE? Absolute scammers and terrible at it. Your info on my bio is not correct you have me related to ex-husbands present or past wives no children mention no family I still have living phone numbers I don’t have nothing of value to anyone who might be looking for me! DON'T TAKE THE BAIT. SCAM!!! THE BAIT IS A TRIAL FOR $1. WHEN YOU TRY TO CANCEL BEFORE END OF TRIAL, THE WEBSITE NO LONGER EXISTS AND THE TELEPHONE NUMBER IS ROTO RECORDINGS FOR DIFFERENT PRODUCTS. I LISTENED THRU 15 BEFORE HANGING UP. You can look, but you can't print (unless you pay more $) They somehow manage to disable the print function on the browser and if you copy and paste into a document, it only pastes the link to most of the data. Thy imply that there is even more information available for even more $. I didn't try to scrnprnt. Scam that needs to be shut down. DO NOT USE THIS SERVICE! It did not find criminal records that another service was able to find in minutes! aunt....and when you go there they want you to pay money. They tried to tell me they found her in jail.....I bet the cell smells pretty good because she has been dead for about 25 years!!!! on my aunt and cousin....nothing plus nothing is still nothing and they want me to pay for that!!!!! Free for $20+ a month.